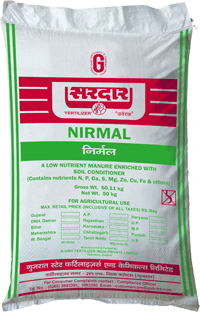 Sardar NIRMAL is a low nutrient fertilizer that contains organic matter, beneficial micro-organisms, essential macro nutrients like Nitrogen, Phosphorous, Calcium, Sulphur as well as micronutrients like Zinc, copper & Iron which are required for crop growth & development. It gives soil conditioning effect & helps to pulverise the soil combined with reducing soil alkalinity. Magnesium (Mg) – 0.6% Iron (Fe) – 0.1%. Sardar NIRMAL improves soil health resulting in improving the efficiency of chemical fertilizers. It meets all standards for protecting the environment and human health by being pathogen-free. The beneficial microbes present in Sardar NIRMAL slowly breakdown the readily-digestible nutrients in the product. This results in slow release of nutrients which maintains soil health over time. The loose, fertile soil produced by Sardar NIRMAL is shown to have an abundance of aerobic bacteria meaning that it is oxygen rich for “good bugs” to flourish. While pathogens are destroyed during the manufacturing process, beneficial micro-flora still exists which improves soil health. Applications: useful for all crop conditions @ 2-3 MT per acre.